For experimentalists in the field of materials science, a particle with a diameter of, say, 5 nm (some 5000 atoms) is very small. However, even for such small particles, fully quantum-mechanical calculations are totally unfeasible. And going beyond static properties makes the situation even more unwieldy. To push the boundaries of e-science closer to realistic applications, development of methods and models at all levels is needed, from the electronic scale to coarse grained simulations. In particular, we must find ways to combine methods in a powerful and creative fashion to bridge the different time and length gaps in a seamless fashion. 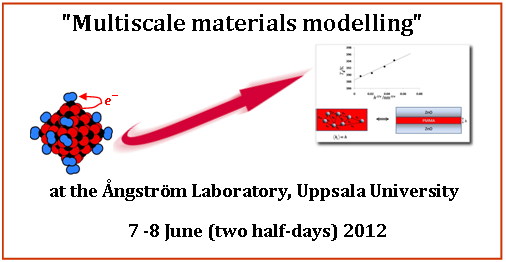 At this meeting, arranged by the national e-science programme eSSENCE – where Uppsala University, Lund University and Umeå University are partners – we will discuss the challenges of multiscale modelling, as well as a number of interesting examples of modern materials and molecular simulations. We will use the word “materials” in a broad sense, i.e. also including molecules and molten materials (liquids). Colleagues from our national sister program SeRC, as well as other e-science actors or otherwise interested colleagues are welcome to attend the meeting. Senior researchers, postdocs and PhD students are all equally welcome to attend. The invited external speakers on Day 1 will discuss materials modelling at different length- and time scales. Professor Per Hyldgaard (Chalmers University of Technology) will tell us why dispersion interactions are a challenge for periodic DFT calculations and how to possibly remedy the problem. Professor Hans Ågren (KTH) will talk about high-level non-DFT and QM/MM calculations, with some history and outlook. Dr. Jörg Behler (Ruhr-Universität Bochum, Germany) will concentrate on the development and application of efficient interatomic potentials based on artificial Neural Networks. Professor Bengt Andersson (Chalmers University of Technology) will discuss the design of chemical reactors with the help of micro-kinetic modelling and computational fluid dynamics. The invited and contributed presentations and posters on Day 2 will add depth and breadth – both in terms of methods and applications. The meeting and the dinner will be free of charge to registered participants. Sign up for the meeting by sending an e-mail according to the instructions below. Participants from outside Uppsala will also receive hotel accommodation in Uppsala free of charge. Sign up as indicated below! Posters will be accompanied by short oral poster presentations – you are most welcome to sign up to present a poster! You do not necessarily have to make a new poster for this event, but you are welcome to present any poster that you think conveys some interesting aspects of your work. There are also a few slots available for contributed 15-minute oral presentations (not connected to the poster session). Please indicate if you are interested in giving one of these. Need a hotel room? If yes – are you willing to share rooms, and if so – with whom? Special food request, if any? Do you want to present a poster? If so, give title of poster and list of authors. If a slot is available, would you like to give a 15-minute oral presentation? If so – Give title of poster presentation and list of authors. Conference locality: The meeting will take place in room Å2005 at the Ångström Laboratory (Lägerhyddsvägen 1; see map on the web; room Å2005=take the first corridor to the left after the main entrance and look for the 5th room) starting after lunch on Thursday 7 June 2012. 17.45 .le. 60 min Oral poster presentations. Best regards and hope to see you at the materials meeting in June! Additional information about accommodation, locations and other details – here.